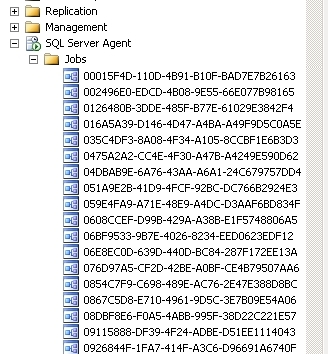 So you want to manually kick off a Reporting Services subscription outside of its usual schedule ... easy you think, I'll just run the SQL Agent job. For some reason, reporting services wants to keep it a secret which job runs which subscription, by using easy to remember GUID based job names. Just find the job with the same name as the ScheduleId of the report subscription you want, and you can manually start it whenever you like. Thanks for posting this--this really saves a lot of time figuring out which job is for what schedule (doing it manually). Knew I'd seen this on your blog Uncle Tim ... and now it's come in handy 2 years later! Nice. Thanks a lot friend.. helped a lot. It's because of a *really* bad design flaw. 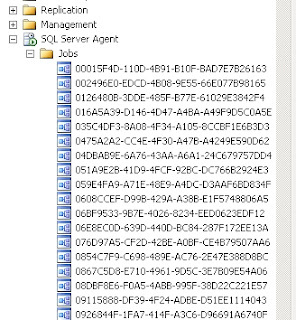 The link between the SQL Agent Jobs and the ReportServer.dbo.Schedule table is via the SysJobs.Name column!!! !